Outstanding sunset at the Venetian Yacht Club, the fabulous waterfront catering venue located on the Great South Bay in Babylon, New York. I have been working at this venue for decades and am proudly referred to brides and grooms by The Venetian Yacht Club as one of their recommended vendors. 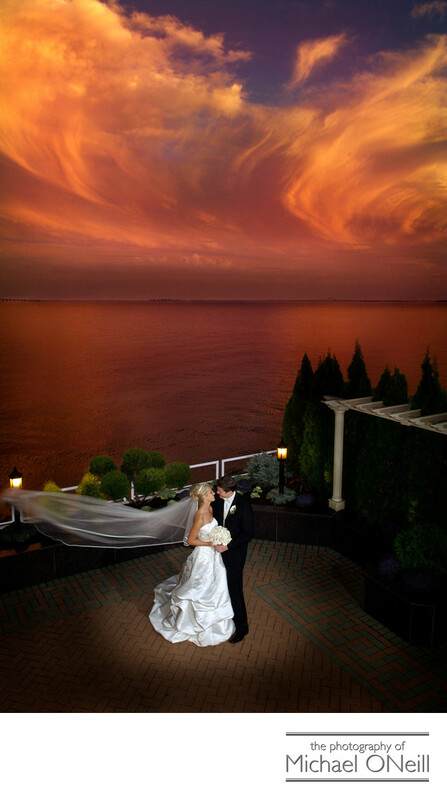 They tell all of their bridal customers that Michael ONeill captures the most fantastic sunsets at their location. This is just one of many. There are a few more to enjoy on this web site and dozens more on display in my East Northport, NY studio and gallery. I would love the opportunity to show them to you.This is one of the most wonderful couples I’ve ever had the pleasure of working with. In the summer months before their wedding we did a pre-wedding couture engagement session at the world famous Sagamore Resort in Bolton Landing on Lake George in the Adirondack Mountains of New York State. I have an entire album on display in my studio just from this amazing session in upstate New York.When the wedding day rolled around the couple was not so lucky. Mother Nature showed up with a bad attitude and buried the couple under a few inches of nasty, driving rain all day long. Their wedding pictures were fantastic, nonetheless, and I actually made a sample album of their wedding day just to show prospective clients what a great photographer can do, even when faced with bad weather on the wedding day. After their church ceremony we retreated to the Huntington Hilton in Melville, NY where we took all the pictures of the wedding couple and their bridal party. Under the cover of umbrellas they all got back in the limousines for the ride over to the Venetian Yacht Club, about 15 minutes away.We arrived there within moments of sunset and, like a miracle, the storm clouds receded and revealed this awesome sunset. I grabbed the bride and groom from their car and had them immediately run after me. Experience told me that this gorgeous sky would turn to darkness in just a few minutes. We went out on the deck overlooking the Great South Bay with Fire Island in the background. I captured a half a dozen outstanding sunset pictures before the sun set completely and left us in total darkness.I offer this story as advice for anyone shopping for an outstanding wedding photographer. I have been pursuing this endeavor for more than thirty years and have witnessed every possible weather scenario that you can imagine. Almost any competent photographer can take a reasonably good picture on an overcast day, but it takes a truly accomplished photographic artist to make the magic happen under adverse conditions. When interviewing photographers for your wedding don’t just let them show you their best work, created on the best of days. Ask to see some work that was produced under less than ideal weather conditions. A masterful photographer can make the magic happen anywhere...anytime. I wish you nothing but the best on your wedding day, but am prepared if Mother Nature doesn’t cooperate. I would love to share my images and my insight with you. Give me a shout and we’ll get together to discuss your plans (Plan A and Plan B) for your wedding day.